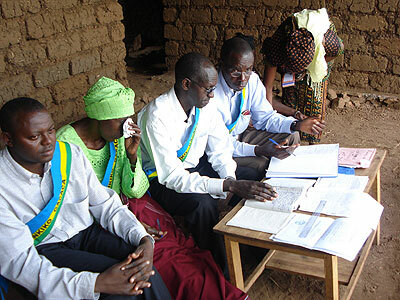 Gacaca judges during a session. The semi-traditional courts closed in June last year. A senatorial committee has announced plans to probe cases that are related to Gacaca, more than a year after the semi-traditional courts closed shop. The Standing Committee on Political Affairs and Good Governance reached the decision yesterday. “We have heard reports in the media, though we don’t have concrete evidence, that some people want retrial. We want to know the real situation. Is it because they know Gacaca has gone, they want to take advantage We want to assess the contentious issues left behind by Gacaca and how people are managing the post-Gacaca situation,” Senator Appolinaire Mushinzimana, the committee chair said in an interview. The Senators will travel to select areas countrywide and meet and talk to various leaders at different levels and the National Commission against Genocide to gather facts. “Some of the issues we are likely to look at include the cases that had not been concluded by the time of Gacaca closure; including the issue of people who were supposed to repay property they looted, or destroyed, during the Genocide,” the Senator said. Mushinzimana said they are likely to consult the Ombudsman’s Office because it could have received related complaints from the public. After being efficiently informed, the Senate will then recommend the best strategy to address post-Gacaca challenges. Bernadette Kanzayire, the Deputy Ombudsman in charge of preventing and fighting injustice, told The New Times that the office had reffered some cases to courts, local mediators or prosecution. “Some complaints come directly to our office and some we get to know about them when we travel to the countryside. But what we usually do is to give people proper orientation. In seeking re-trial, we refer them to the primary courts, Abunzi or Prosecution. The law closing Gacaca courts is clear enough,” Kanzayire said. 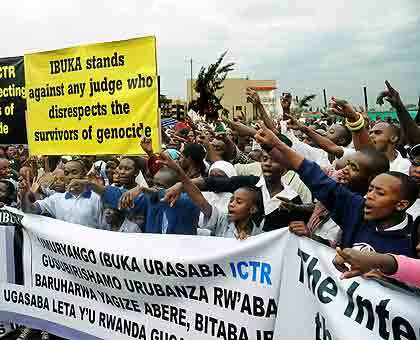 Ibuka executive secretary Naphtal Ahishakiye said that the umbrella organisation of survivors of the 1994 Genocide against the Tutsi “approves of the work done by the Gacaca courts” but there are still problems to contend with. Top among these cases, Ahishakiye noted, is property that was destroyed during the Genocide or looted, that have not been concluded. “This problem actually affects the unity and reconciliation process,” Ahishakiye said. Ahishakiye said appeals for cases previously concluded under Gacaca to be re-tried is uncalled for. “We were satisfied by the manner in which Gacaca courts handled and wrapped up cases. But now, in primary courts, there are appeals from people who had received life sentences. The people who are appealing Gacaca verdicts are most often rich – these courts are susceptible to corruption that needs to be carefully looked at,” Ahishakiye said. The other issue concerns people who eluded justice throughout the course of Gacaca courts by relocating either to different parts of the country or leaving the country altogether. Gacaca, Rwanda’s traditional conflict resolution mechanism, aimed at responding to the post-Genocide challenges, including how to provide redress for victims, hold perpetrators accountable for their crimes, and restore harmony among Rwandan. The courts were officially closed by President Paul Kagame on June 18, 2012. This was 10 years after their launch. The Rwf 29 billion courts tried nearly two million suspects within the 10 years, promoted reconciliation and helped unearth the truth about the Genocide. The courts are said to have succeded at 87 per cent.